The Centrifugal Reinforced Concrete(CRC) column developed by SEN Engineering is a method utilizing PHC(Prestressed High Strength Pre-Stressed Concrete) piles as columns. The CRC column is able to obtain the maximum capacity as for a reinforced concrete column due to its manufacturing method using centrifugal force to produce high strength concrete same for PHC and inserting a reinforced cage instead of a pre-stressed wire decreasing compressive strength in PHC. This expeditious and economical way to produce concrete of strength more than 80MPa by centrifugal casting makes CRC columns be easily and quickly applied to the construction site than PC(Precast Concrete). CRC column is not only improve applicability but it also enhances constructability because its buckling capacity higher than H-section column leads to increase the depth of penetration. If a required service load is higher than the capacity of the CRC column, it can be reinforced by additional concrete casting with re-bars in the site to obtain sufficient strength. The seismic resistance performance of the CRC column-to-TSC beam connection is previously demonstrated in accordance with KBC 2009 by experimental test, and the real scale test of the connection is conducted in this study. 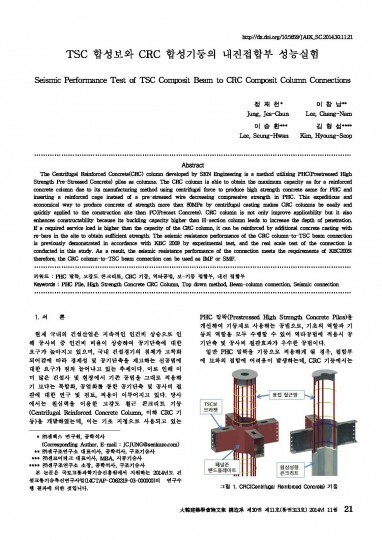 As a result, the seismic resistance performance of the connection meets the requirements of KBC2009; therefore, the CRC column-to-TSC beam connection can be used as IMF or SMF.